Wyatt Gillette, 8, of Orange, was named an Honorary Marine and a ceremony was held for him on Saturday, July 30, 2016. Wyatt died the following day. 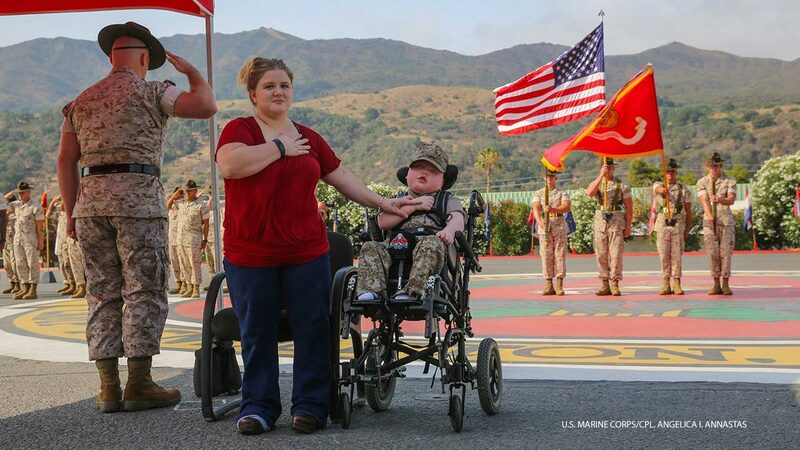 ORANGE, California -- An 8-year-old Orange County, California boy with a rare disease died one day after becoming an Honorary Marine. Wyatt Gillette suffered from Aicardi-Goutierres Syndrome Type 1-(Trex 1 mutation), a rare condition that caused him multiple medical problems, including seizures and complete kidney failure. His father, 29-year-old Jeremiah Gillette, is a Marine drill instructor and said he wanted to see his son become an Honorary Marine. As Wyatt fought for his life, his father turned to fellow Marines on social media, asking for prayers. What he got was an outpouring of support, and a petition was started to make Wyatt an Honorary Marine. The U.S. Marine Corps. granted Wyatt's request, an honor only bestowed on a select few people per year. A ceremony was held at Camp Pendleton on Saturday as Wyatt's parents watched he was bestowed into the Marine brotherhood. Jeremiah Gillette said Wyatt passed away at 10:06 a.m. on Sunday. He said Wyatt was peaceful and pain free. "Thank you all so much for letting Wyatt into your hearts, and allowing him to make you smile, it was his favorite thing to do," Jeremiah Gillette wrote. The Gillette family requested privacy in the meantime as the cope with the death of Wyatt.